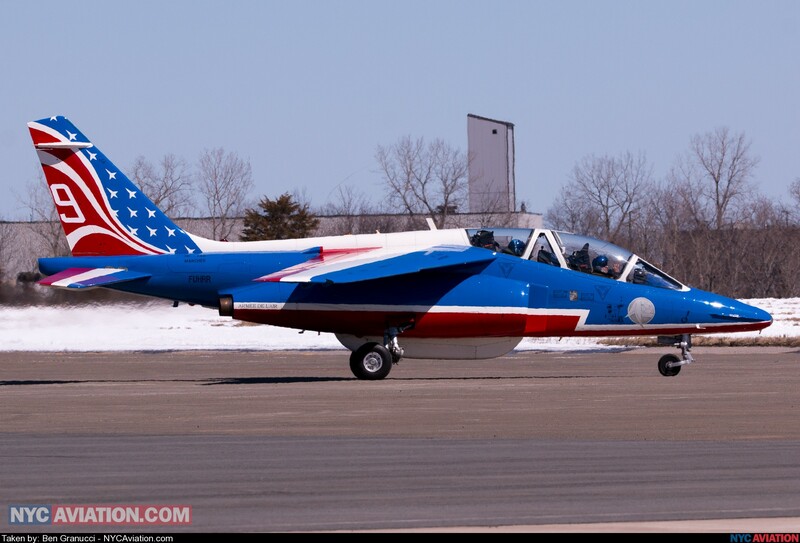 The Patrouille de France arrived at Newburgh-Stewart International Airport (SWF/KSWF) north of New York City on Thursday, the first stop on a 6-week North American tour. The tour commemorates the centennial of the United States’ entry into World War I. The tour brings with it a variety of aircraft, many of which are not often seen in North America. 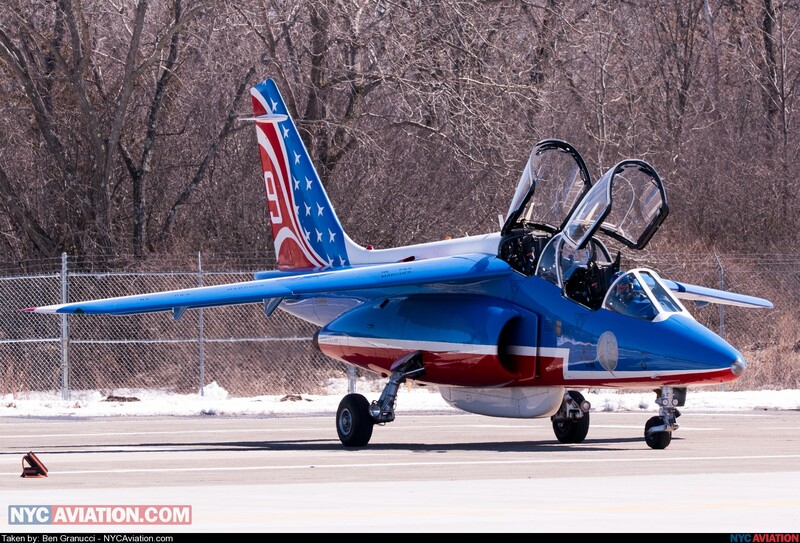 The performance aircraft are Dassault/Dornier Alpha Jet E two-seat trainers. 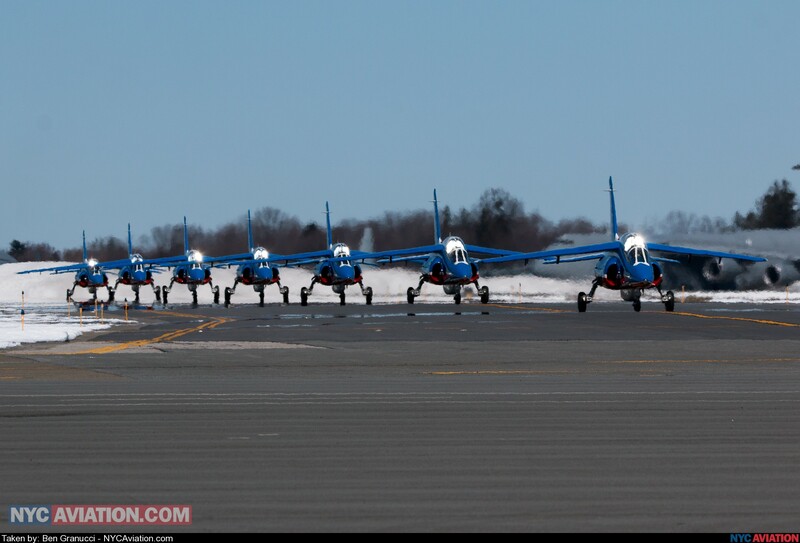 Ten of these aircraft accompany the team, with 8 jets performing in the aerial displays. Support aircraft for this trip include a Dassault Falcon 50 and an Airbus A400M Atlas turboprop transport. Making a journey across the Atlantic is no simple feat for these small Alpha Jets, which only have roughly 1,800 miles of range in ferry operation and no capability for inflight refueling. The transatlantic crossing consisted of 7 legs, with stops in Scotland, Iceland, Greenland, and then Goose Bay in Labrador and CFB Bagotville in Quebec. While in Bagotville, the crews stored the wing-mounted drop tanks that they used for the crossing. They will retrieve them in early May for the trip home. 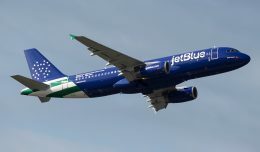 Seven of the ten Alpha Jets on the tour arrived in New York shortly after 1:00 PM Thursday, about 2 hours behind schedule. The remaining three jets were beset by mechanical issues brought on by the extreme cold in Greenland and Canada. The temperature in Bagotville at departure time was a mere 10°F (-12°C), and the jets had been near 0°F (-18°C) overnight. 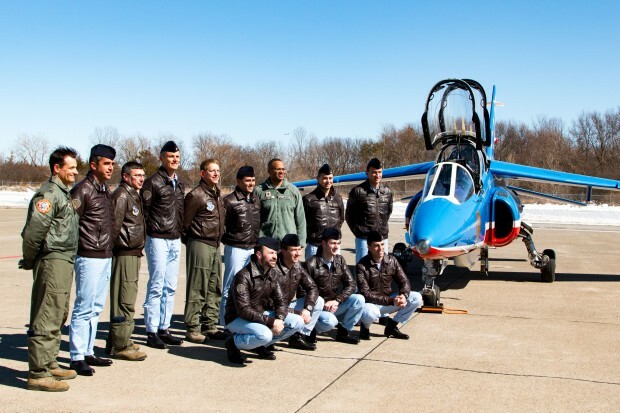 The remainder of the Alpha Jets and the support aircraft will rejoin the team in the coming days. 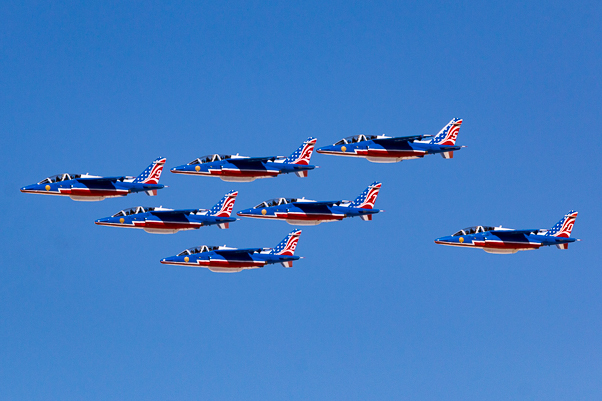 On arrival at Stewart, the team performed a series of low altitude formation passes over the airport. Reports from outside the airport fence indicated that many cars had stopped along nearby roads in anticipation of the flyby. After landing, the team cleared customs and then met with a contingent of media from the United States and France. After a training day today, the team will perform a flyby of New York City and the Statue of Liberty on Saturday. Another flyby, this time in Washington D.C., will occur on Sunday, before the team heads to Florida. There, the team will conduct their first American airshow performance in 31 years at the Melbourne Air & Space Show on April 1 and 2, followed by performances at Sun ’n Fun in Lakeland, FL. Following those performances, the team has a jam packed 5-week schedule that includes numerous performances across the United States and Canada in places like Kansas City, MO; Sacramento, CA; Norfolk, VA; and Gatineau, QC, near Ottawa. 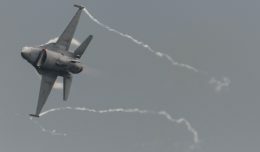 The team will perform flybys of several locations, including the Grand Canyon, the Golden Gate Bridge, and the U.S. Air Force Academy in Colorado Springs, CO. They will also visit with the U.S. Navy Blue Angels and U.S. Air Force Thunderbirds at their respective home bases. The flight crews from the Patrouille de France pose with a few members of the US Air Force and New York Air National Guard in front of one of the Alpha Jets. 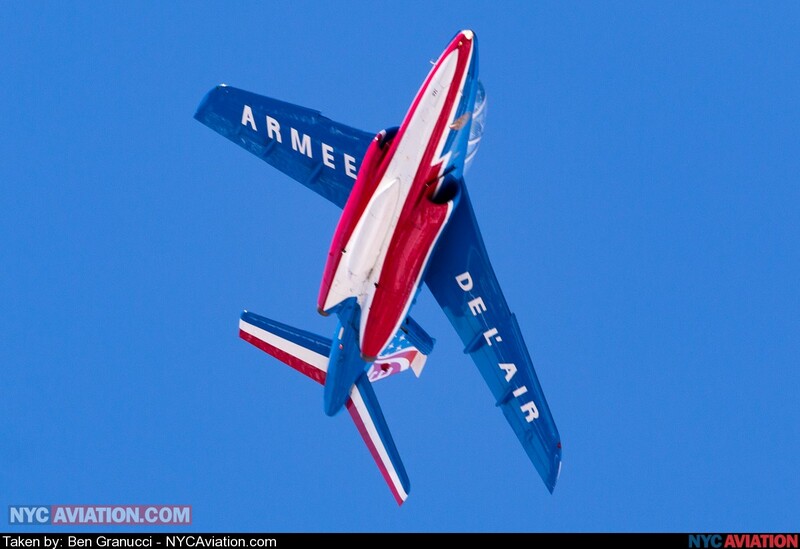 Photo by Ben Granucci, NYCAviation. Ben Granucci, Senior Editor, is an aviation enthusiast and plane spotter based in New York City. Growing up in Connecticut, he has had his eyes toward the sky for as long as he can remember. He can be reached on Twitter at @BLGranucci. 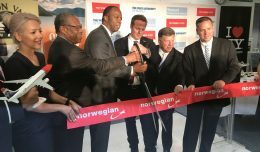 Norwegian Air International made history at Stewart International Airport in Newburgh, NY on Thursday with the launch of transatlantic flights. 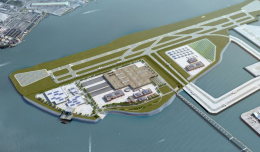 Not So Fast: Would 3rd Runway on Rikers Island Alleviate LaGuardia’s Ailments? NYC wanting to close Rikers Island is bringing along the idea of adding a 3rd runway to LaGuardia, but does it pass the sniff test? I wish they would come to St. Paul. I hope they fly over Denver!